Values-driven organizations are considered by some to be the most successful on the planet. They have high levels of engagement, generate higher earnings, and are more profitable by having an inclusive, multi-tiered strategy. It’s a win-win! 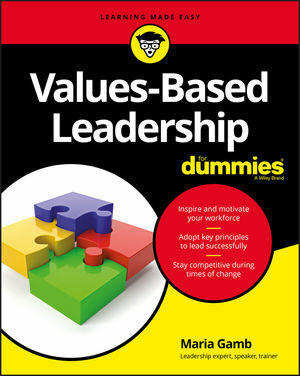 In Values-Based Leadership For Dummies, you’ll get a fool-proof plan for putting the principles of values-based leadership in action—which will inspire and motivate others to pursue what matters most. With many Baby Boomers edging toward retirement, the largest generation in history, the Millennials, will be taking over the reins and stepping into leadership roles. They’ve suffered through the difficult economic times and corporate scandals of the early 2000s and they want things to be different. Inside, you’ll get the framework for adopting the principles of values-based leadership that will help Millennials—and any member of any organization—thrive: utilizing the tools of self-reflection, actionable grace, agility, and a commitment to lead responsibly. Whether you’re in an entrepreneur, entry-level position or a CEO, employees at any level can benefit from leaning into values-based leadership—and this book shows you how!